Creep was one of the first found footage horrors I ever saw where the killer themselves were the focus of attention. The acting needs to be great for this type of film (as with Be My Cat: A Film for Anne and Capture Kill Release) and as it was for Creep, in fact Mark Duplass who played the killer won an award for Best Actor in a Leading Role in the 2015 Fright Meter Awards (that I'm on the panel for). Creep 2 is a straight sequel to that one and has the honour of being the first sequel to one of these more realistic found footage films that I have seen. 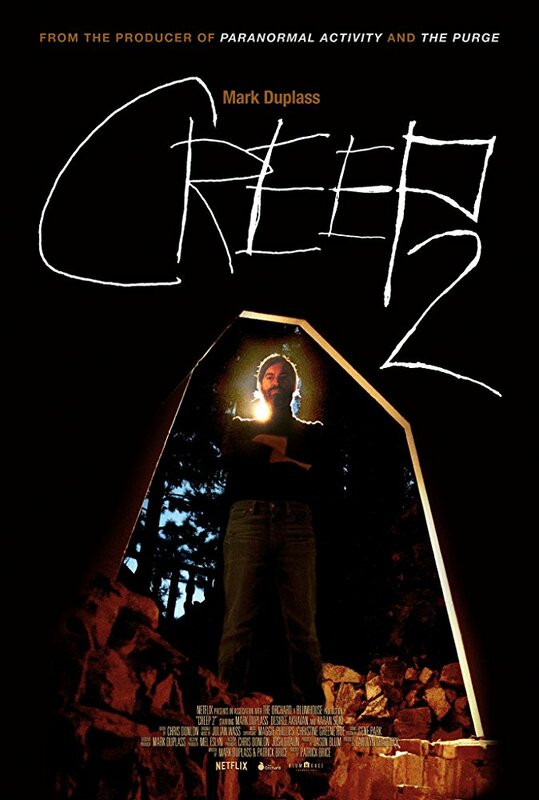 Creep 2 is a lot more funny than the original film was, so much so at least in the first half that I thought this was following the route of Gremlins 2 by almost being a mickey take. All the same tricks that were pulled in Creep are copied here, but with humorous results, Aaron's constant attempts to scare Sara fail spectacularly with it seeming like nothing can faze her. His 'scenes' he is making for the documentary become farcical with the amount of problems he is facing, leading to a laugh out loud moment when he starts to angrily hurl rocks at off screen birds whose singing kept interrupting his monologue. The second half dials back this comedy edge a bit until it finally devolves into proper horror again for the final quarter. I loved how Aaron seems to have met his match with Sara, all the weird things he does bounce off her completely. The first Creep had a really awkward bath scene involving a naked Josef (that the character was then called confusingly), here that is replicated when Aaron strips naked (full frontal on camera) as a way to 'strip' away the barriers between him and Sara, but then he is surprised to see her replicate his action (out of camera shot). 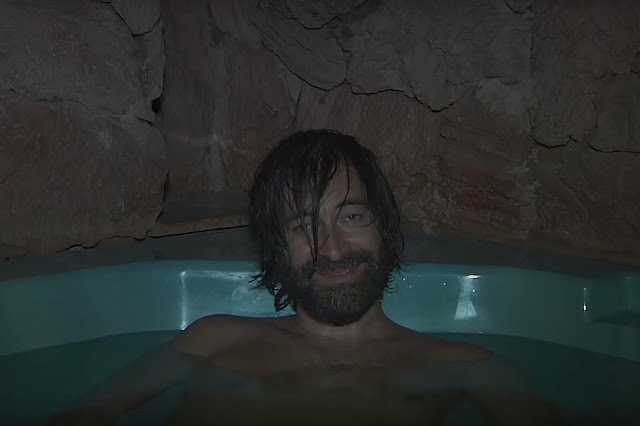 Duplass is simply excellent again in his role, by far the best thing about Creep 2. He is so believable that I was never sure when his character was being truthful or not, it made it impossible to tell what was fact and what was fiction with this guy which I loved. This character is fantastically played and a real enigma. Much like the first film though this led to the second person playing second fiddle. While it made for a darkly comedic situation of having such a hard to impress or shock person (who actually manages to scare Aaron far better than his attempts) we never really get to know much about her. She is desperate to make a good episode for her show which explains away her not listening to her gut instincts about the weirdo she is with, yet she is pretty unemotional throughout and so a hard person to get behind. Still she was a better character than Aaron (as in the Aaron from Creep) whose actions felt more unrealistic. I felt the original film slipped a bit in it's final act due to the killer being out of the story for a while, here he stays front and centre from beginning to end yet I still felt the film flagged a bit. There is around ten to fifteen minutes when Aaron and Sara have kind of become actual friends (at least from her perspective), a prolonged game of hide and seek and other bonding moments get me feeling a bit bored with these scenes not really adding anything noteworthy at all. There are some great scenes here even if there is nothing as scary as the original. Knowing exactly what sort of person Aaron is immediately takes away any sense of proper horror so going down the comedy route actually works in that regards. The best scene was one set in a hot tub where Duplass gives some awesome prolonged single shot monologues, the lighting and the framing of this scene was quality work. Creep 2 is a better film overall than Creep, Duplass is on form again while how director Patrick Brice and Duplass handled the story was a master class in how to make a sequel. How they play with the audience expectations is pretty special. However again like before it did feel like it dragged slightly towards the end, and personally the long black screen cutaways irritated more than anything as I kept thinking my phone was playing up. With a confirmed Creep 3 in the works it will be interesting to see how this unlikely trilogy is finished up.